The 2017 Volkswagen Passat in Orlando makes the perfect travel companion. With its abundant cabin space and numerous high-end features, the five-passenger sedan is an ideal choice for those who want a luxurious ride without a hefty price tag. Unlike many of its midsize competitors, who get pretty frequent facelifts, the Passat has kept true to its exterior styling. And that's perfectly fine, according to one 2017 Volkswagen Passat review that says: "With reserved but classy styling, the Passat has a pretty timeless look to it." We couldn't have said it better. 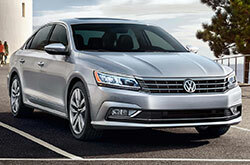 Find out more about the new Passat below. Available in S, R-Line, SE and SEL Premium, the four-door vehicle comes well-equipped at all levels. Exterior features include standard 16-inch alloys, automatic headlights, power accessories, dual-zone automatic climate control and height-adjustable front seats. Buyers of the 2017 Volkswagen Passat in Orlando will also get to take full advantage of a six-speaker sound system, Bluetooth phone and audio connectivity, a 5-inch touchscreen and much more. The range-topping SEL Premium takes amenity further with power-folding mirrors, an eight-way power passenger seat, driver memory settings and leather upholstery. The 2017 Passat comes standard with front-wheel drive, as well as two available engine options: a 1.8-liter turbocharged four-cylinder and a 3.6-liter V6. The standard four is able to achieve 170 horsepower and 184 pound-feet of torque, while the V6 (offered on the Limited and Premium trims) is good for 280 horsepower and 258 pound-feet of torque. 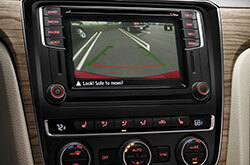 A rearview camera and a forward collision mitigation system with automatic braking are standard on all models. Several 2017 Volkswagen Passat reviews recommend adding optional equipment like blind-spot monitoring, rear cross-traffic alert and lane departure warning for enhanced safety. 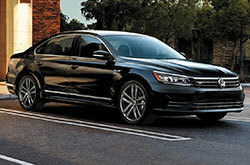 Visit our Orlando Volkswagen dealership today to find out more about this savvy sedan! 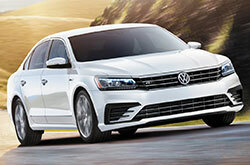 Want More Details on the Volkswagen Passat? The esteemed 2017 Volkswagen Passat should be on your shopping list, especially if you've been searching for the 2017 Ford Fusion, Toyota Camry, Honda Accord and the Nissan Altima near Orlando. You could end up loving its deviceful on-board technologies and finely crafted design among other attributes. Utilize the details listed in our review to see if the 2017 Volkswagen Passat fits your traveling needs, then check out Volkswagen financing offers online! Find factory offers on the extolled Volkswagen Passat at David Maus VW North, a resident dealership with a topflight selection of Volkswagen models. It's critical to make a knowledgeable choice when searching for a car, and we hope our 2017 Volkswagen Passat review is handy when it comes to this. 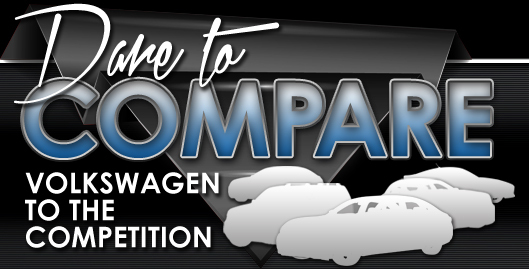 We have many Volkswagen Passat models for sale in Orlando, FL; stop by to be pleased with a test drive - setting up an appointment on our website is easy. Are you eager to see it preceding your visit? Check out the enclosed video to view its full exterior.